Obviously, although this function is designed as a faster version of ace(...,type="continuous",method="ML"), the function actually runs by using many calls to ace(...,method="pic")!! 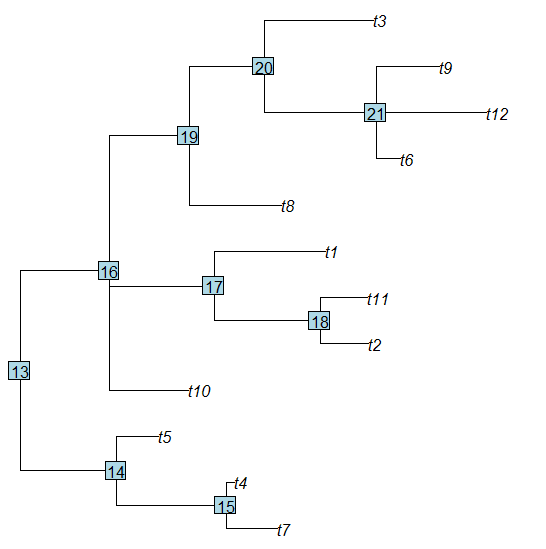 The object name btree in this code is used to denote binary tree. This highlights the fact that, obviously, contrasts can only be computed for bifurcating trees. We would still like our function to run, though, if the tree contains multifurcating. The remainder of the function code is dedicated to, first, changing a multifurcating tree to a bifurcating one; and then, after computing ancestral states using the code given above, lining up the nodes on the binary tree to the nodes of the original tree containing multifurcations. The way a did this is a little ad hoc, but it seems to work. I basically went through all the nodes on both the binary and multifurcating tree and, for each node, pulled out a list of all the descendant tips. Then, I used these lists of descendant tips to match nodes between trees. The code for this function, fastAnc, is here. Let's try it and compare to both ape::ace and phytools::anc.ML. Obviously, we get the same estimates from each function - but at much greater computational cost (particularly for anc.ML, which is pretty terrible). "phy" is not rooted AND fully dichotomous. 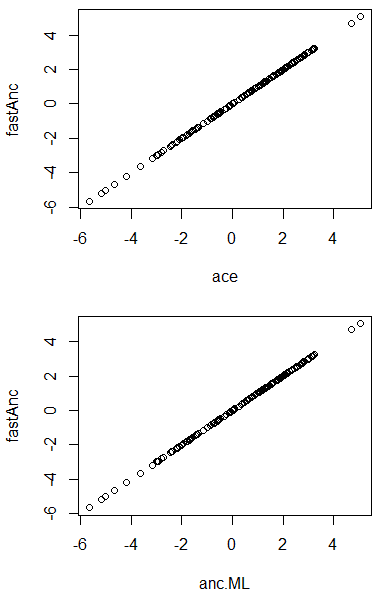 First off - ace doesn't work at all if the tree is not bifurcating (not sure why this is). anc.ML works fine, but will be very slow for large trees (as we've discovered). fastAnc gives the same estimates and node names - even though it had to first convert to a bifurcating tree, and then back-translate the node numbers. Great! Is it possible to do ancestral state reconstruction for a discrete character using maximum likelihood incorporating uncertainty over let's say 1000 trees and then plotting the uncertainty in the pies with the states? I can only do it with Mesquite and would like to do it in R.
A second question on the same train of thought, is it possible to use the simmap function also on 1000 trees and plot a summary of the 1000 maps on the tree? Thanks again for the amazing blog!